Only 12h 49m 12s left! - Michael 4 to Paul (TTv2_M4_To_Paul.zip) & Victoria 4 to Pauline (TTv2_V4_To_Pauline.zip) which are included in the TTv2 base software. Paul to Michael 4 (TTv2_Paul_To_M4.zip), which is included in the "Texture Transformer Male Add-on Pack." Pauline to Victoria 4 (TTv2_Pauline_To_V4.zip), which is included in the "Texture Transformer Female Add-on Pack." If you have not bought our Blacksmith3D version 7 or Texture Transformer version 2, we invite you to visit our Blacksmith3D Free Stuff page to test drive our Free Trials of Blacksmith3D PRO-7 or Texture Transformer version2. 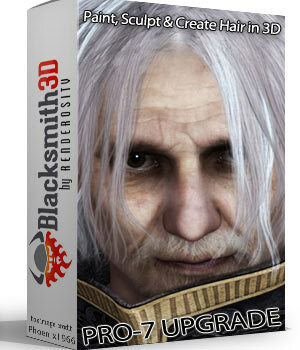 You can also get more information about software from our Blacksmith3D Store. Did you know? 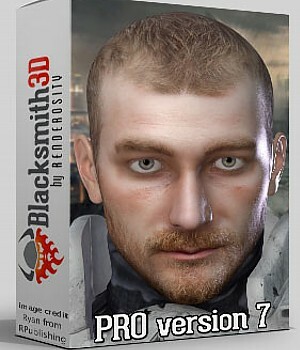 We also have an optional monthly subscription available for our Blacksmith3D PRO-7 edition (that includes our Texture Transformer version 2) for just $8.95 a month. This is a great way to try our software with the save and export enabled or get your Texture Transformations without watermarks, which are not available features in the Free Trial software. Please visit our Subscription Page on Blacksmith3D.com to get more information about subscriptions. Created for professional CG artists and novices, Blacksmith3D provides artists with easy-to-use tools to create high-quality art. 3D artists who are using popular modeling, animation and rendering packages find Blacksmith3D very simple to integrate into their pipeline and enhance the quality of their art in a short period of time. 2D artists, who are looking to experiment with 3D software, find Blacksmith3D very intuitive, as it has a common 2D paint application look and feels. And, the PRO-7 edition comes with our Texture Transformer version 2 software that is great for converting skin texture maps from many popular figures to another from cr2, duf, pz2 or mc6 file formats, and can even handle the transformations in a batch process to save time. There is an all new Hair tab for tools to create hair from scratch or to edit and existing hair model. Import hair models in multiple file formats (obj, fbx, cr2, pp2, hr2, and duf) as long as they are transmapped and not dynamic. 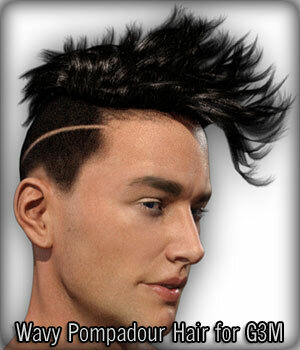 The hair is created and edited using an industry standard for 3D hair, which is based on two main elements. • A skull cap, or growth surface, which serves as a foundation for hair to grow out of (scalp). • And Hair Strands. Create flat, rectangular strands that use a combination of transparency and color maps to give the illusion of several individual hairs. A hair piece can be created from scratch, given the raw geometry used for the growth surface. Also, an existing hair piece can be edited as it is, or have additional strands added to it. For users that do not use a drawing tablet, and for creating special effects like small hairs on a surface, the Auto Pressure feature can vary the simulated pressure for each paint stroke. To create a hair effect, the Auto Pressure Midpoint may be set to a small value like 5%, to create a fatter base and a thinner tip. Stroke smoothing will automatically smooth out the path of the paint stroke to give a curvier effect. This will dramatically decrease "jitters" in the paint stroke that may be due to painting with a mouse or other pointing device that does not offer the natural motion of a stylus. Painting speed has been optimized for overall speed, and to reduce bottlenecks/lag when applying paint strokes to multiple high-resolution textures. Export and import subsets of your project using Templates. Templates can be customized specifically for your workflow. Examples of what can be stored templates. Complete character setups - Apply your own custom default settings for any character simply by importing the template. May include default textures, morphs, display groups, presets, etc. Image Map Layers - Create a template that stores only certain layers that can be reused in other projects. 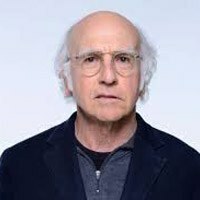 Morphs - Create templates for common morphs that will be reused often. Hair - Create templates for starting your hair projects, including custom growth sources, hair textures, etc. Almost anything that exists in a Blacksmith3D project can be stored and reused in a template. Auto-assign image maps to all materials that share the same map for standard commercial figures (like Genesis figures, Dusk/Dawn, or V4/M4, etc). So if you assign a map to the material "Face", you will be prompted to automatically assign the same map to all other materials in that set like the lips, nostrils, mouth, etc. Assets imported from your content libraries can now be stored as Fixed Assets in Blacksmith3D. This means that instead of saving and loading the data in every Blacksmith3D project and/or template file, they can be reloaded from their original file location instead. This makes project and template files much smaller, and faster to save. Examples of items that are good candidates for fixed assets are. • Texture maps that are used for display, but not being edited. Fixed assets are especially useful when creating templates since the template can be redistributed to other users without transferring items that may be protected by copyright, etc. The end user will need to have those fixed assets installed in their content folders. Import ABR files to use as brush tips with ABR version must be 6.1 or 6.2 and only bitmap based brushes are supported. Not all attributes of the brush are preserved due to compatibility reasons. Texture Transformer (TTv2) has received a major upgrade. Skin textures can now be converted using cr2, duf, pz2 or mc6 files AND without having to first save the texture(s) to the original/source figure (you must still own the original/source figure for TTv2 to be able to find it in your 'runtime' path). Also, we have added batch input/source files to batch output/destination files to subfolder paths that you specify, which is perfect for vendors updating their character packs. Finally, the TTv2 packs are now distributed as files, instead of a folder containing multiple files. This makes managing your collection much easier and hopefully will reduce confusion when updating your software. Please remember that TTv2 is only available in the standalone version or in Blacksmith3D PRO-7, and not available in the Standard versions. 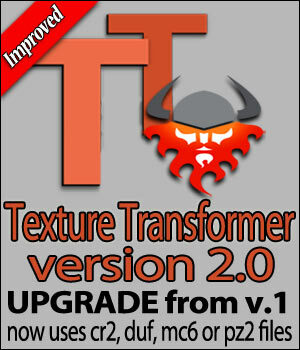 If you have already purchased Texture Transformer version 1, there is an upgrade option you can buy. And, you will not need to buy new add-on packs, if you have bought them for version 1. The add-on products have zip files for the new TT v2 packs that you can download from your Blacksmith3D "Item List" found HERE. Please be careful to get only the ones that start with ' TTv2 ' since the old packs are also there for the people who may not upgrade. You will also want to make sure that you unzip and extract the Texture Transformer packages into the 'TextureTransformerData' subfolder. The folder path is very important. So for each conversion, the TTPack files should be extracted from the zip file so that they look like this after installed on your computer. Please join our newsletter to keep up with all of our new developments. Please contact us at info@blacksmith3d.com if you have any questions or problems. Here's a list of some of our MarketPlace vendors who use Blacksmith3D PRO for their character creations.